Back of card: Based on the head in the Empress card, in light blues. The head is reflected from left to right (ie, two faces, three eyes), which is then reflected onto the bottom of the card. May be inverted. Comments: On the front of the little booklet, the name of the deck is misspelled as "Methamorphosis". Or maybe not. Meth. Could the creation of these cards have been drug-induced? I never take drugs (don't want to), so I wouldn't know. The deck was designed as a key for opening the treasures of that inexhaustible reservoir of creativity that anxiously lies in our consciousness. Anxiously? An interesting choice of words. For "anxious", my American Heritage Dictionary (third edition, 1992, pg. 83a) says, 1. uneasy; 2. causing anxiety; and 3., usage problem eager. There is an additional note that 52% of intelligent, learned people (who would not be caught dead using tarot) think we should never be anxious to see the new show of British sculpture at the museum. I wonder if Lo Scarabeo knows of this sculpture angle. The Tarot of Metamorphosis would seem to be a variation on the Shapeshifter Tarot, which I didn't care for. In Shapeshifter it is usually clear what is being transformed into what. Here it's not. My objection to both decks is that a well-conceived card will tell us a story all by itself, one way or another. The sequence of cards in a reading tells us how those stories turn into other stories, eg, transform - and resolve - the issue at hand. Because tarot always starts with a question. It never starts with the cards themselves. In a transformation deck, the cards are not simply cards. They are individual whirling dervishes, now blinking YES!, now blinking NO!, now signaling MAYBE! Whatever the card wants to say is being drowned out by the ham who's hogging center stage. The Moon card is interesting. On it, the (ruined) towers that I have seen somewhere in Italy (there is a notable Italian town full of towers) are transformed into the (destroyed) New York World Trade Center. We could have fun with this. We know the moon is dead. The ruined city beneath it is dead or dying. In the reflection, what do we see? Is it the former living moon, the former living city? But how could that be? In that city, the towers were destroyed. Not ruined or abandoned. Is the city in the waters a reflection of what the decaying city once wanted to be, but was not? Is this an old, decrepit man who longed for heroic martyrdom at a young age, but instead became angry & frustrated as he aged? 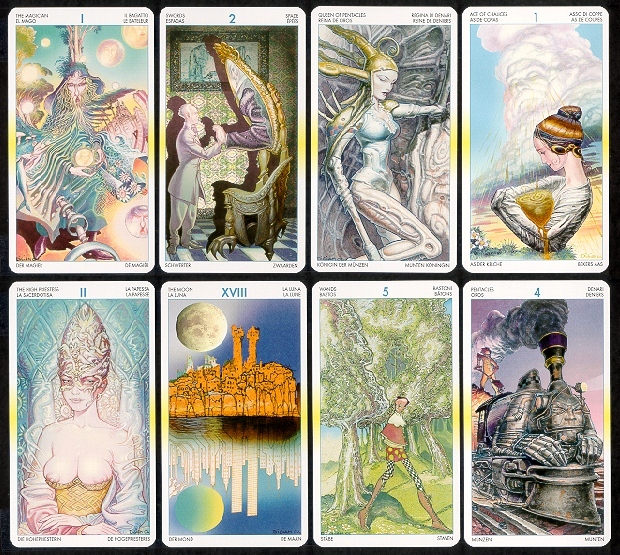 The original artwork for a tarot deck is always far larger than the eventual cards themselves. I have the impression the artist worked in far too many details for the cards to show. A lot of the cards don't seem to make a lot of sense. In my opinion, the Shapeshifter Tarot, with its simple images, is superior.